We'd still like to see OneNote integration, though. 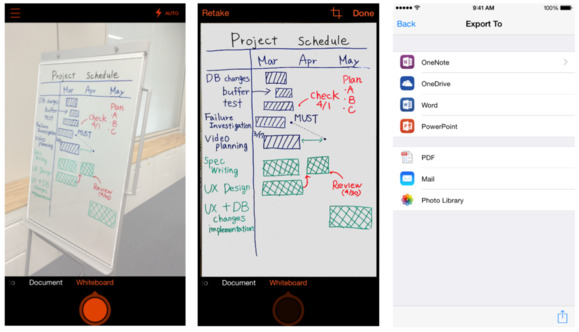 Currently, Microsoft’s Office Lens is a specialized mobile application for pulling images of whiteboards and other visual information into Word documents and PowerPoint presentations. But Microsoft says it will soon become much more powerful. Office Lens originally debuted on Windows Phone, but it moved to Android and the iPhone in April 2015. It was handy for classrooms and meetings because you could take a picture of a whiteboard, for example, and Office Lens automatically aligned the photo so it would look like a screenshot. Office Lens was originally a standalone app, but as of this week it’s built right into the Word and PowerPoint apps within iOS and Android. That makes it marginally more useful, but what’s more exciting is what’s coming down the pipe: optical character recognition, or OCR. Soon when you snap a photo of a presentation, Word will extract the relevant details for easier integration into your notes. It’s worth noting that OCR capabilities are already within Office Lens for Android, albeit with a specific purpose in mind: scanning business cards. But there’s no direct connection to Outlook—the information is scanned into OneNote, which then requires you to edit it before exporting. Also, business-card scanning is not part of the Office Lens functionality within the Word and PowerPoint apps, a Microsoft spokeswoman confirmed. Microsoft revealed the Office Lens roadmap inside a summary blog post of some of the changes being made to the various components within Microsoft Office. Next up is a similar integration path within the Excel app, as well as the ability to capture documents. Why this matters: The new Office Lens features will add important enhancements to Microsoft's mobile apps, so we hope Microsoft keeps going beyond Excel to the OneNote note-taking application—both on the desktop and the mobile space. Microsoft’s current workflow assumes—probably correctly—that any notes taken inside OneNote will eventually be summed up inside a more formal Word document. But OneNote works better as a loose collection of data that the user can collate and distill later, and Office Lens could help with that. Updated at 3:11 PM to clarify that the Office Lens functionality built into the Word and PowerPoint apps does not support business-card scanning.